SaturdayBreakfast — The 220 MHz Guys - "The Good Guys!" 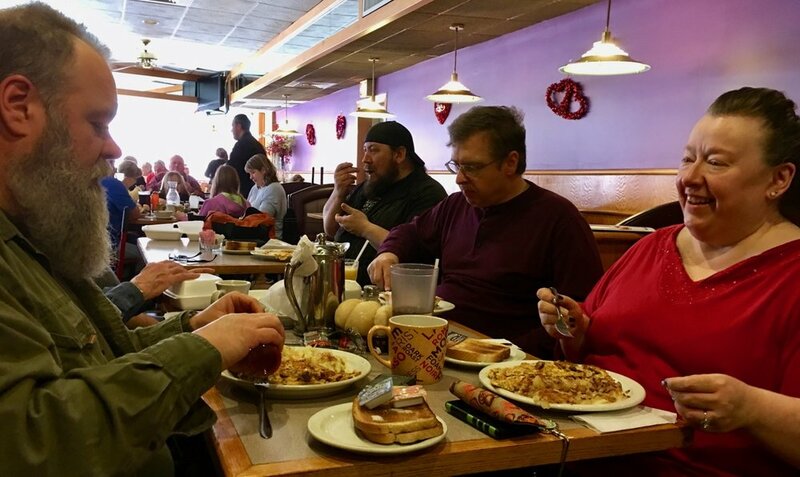 The 220 MHz Guys weekly meet and great breakfast at P.J. Klems in Lyons, at 8000 West Ogden. Breakfast starts around 8:00AM and usually goes well past lunchtime. This facility has ample parking. We are in an area of the restaurant that gives us a feeling of privacy. Just ask the Hostess/Host where the Ham Radio Breakfast is and you will be directed. A little background regarding the weekly breakfast. Around the fall of 2007, a couple of Hams from the South side of Chicago started a breakfast... an "eyeball" meeting if you will, for Hams in the area. They researched local licensed Amateur radio operators in the area using the FCC database via the internet. In January of 2008, with the New Year starting, they sent out postcards as invitations to all local Hams. The postcards made mention of 220 mhz. band operations and the 220 Mhz. Guys, but insisted that ALL are welcome. They put the word out on the air and word of mouth throughout the Amateur Radio community. Soon, they had groups of over thirty people at times, showing up from as far as ninety miles away to meet and greet one another. The event became known as the 220 Mhz. Guys Meet & Greet Breakfast - Just a group of "Good Guys" getting together to share a common interest in radio communications. The group consisted of Ham radio operators, scanner listening enthusiast as well as members & officers from many other clubs and organizations. Local Hams that had the vision and fortitude to make their idea a reality!